The student movement and the strike they have sustained for almost a month at the main campus of the state-run University of Puerto Rico (UPR) and in 10 of the 11 campuses has catalyzed a massive social movement that has convened a national strike for today, May 18, 2010. 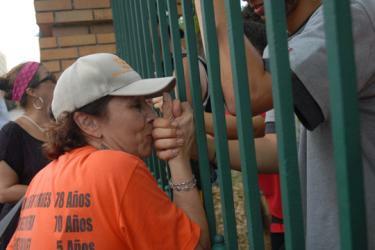 As recent as October 15, 2009, a national strike paralyzed the Island after governor Luis Fortuño layed-off about 17,000 government employees (Please see Global Voices’ coverage of the October 15, 2009 strike here , here , and here ). Workers and members of trade unions, women, students, environmentalists, and professors have joined in support of the national strike convened by the coalition Todo Puerto Rico por Puerto Rico. The goal is to paralyze all 78 municipalities of the Island. Activists, members of trade unions, politicians, artists, professors, the LGBT community, and students from all over the Island, with different ideologies, have supported the students by disseminating their message and joining them in their protest at the Río Piedras campus. Students paralyzed the academic operations in order to protest against a $100 million budget cut and the proposed elimination of certain registration and fee waivers  [EN]. (Please see Global Voices’ coverage of the student strike here  and here ). A kiss for a student inside the campus. Photo by Ricardo Alcaraz of Diálogo. Republished under a CC License. Someone throws a bottle of Gatorade to the students. Photo by Ricardo Alcaraz of Diálogo. Republished under a CC License. Student strike at the UPR. Photo by Ricardo Alcaraz of Diálogo. Republished under a CC License. What I want is for all the land, this island, to be the University. It is difficult to cordon off a whole country. Not impossible, but difficult. What I want is for Puerto Rico to be the University and its neighbors the student body. Then, give away the bell tower to the acting, so he or she enjoy or suffer the echoes of its screams. Then, at the bus stop, at the barbershop, at the mall, I am at the University. What I want is to make a permanent University, constant, like the invisible school of the Rosicrucian, that no one, and I mean no one, can take away from no one because it would not depend on no one depending on all. I mean to say, all who cares. At last, what I want is for the University to be, like in Orwell’s novel, a place in each of our minds. And then, impossible to kill. Impossible. Or let them try. It's important to remember that civil and social struggle are the motors of political transformation, and, in the end, of historical processes. The responsible students, professors, parents and citizens who have joined this protest against the abuse of the actual administration have to understand that even though their efforts have specific goals in space and time, they are also part of a global movement that is also shaking oligarchies in Thailand, Ecuador, United States, and Puerto Rico. 2 horas en la Huelga de la UPR  from Alberto Bartolomei  on Vimeo . The university in which I was formed, grew as a human being, and political animal, read everything that made me love, cry, dissent, understand, philosophize, write, is on strike. Its motives, the most legitimate of all. Our motives. To denounce injustice. Its forms, new configurations, barricades, clowns, interruptions, radios, and rhizomes. We are witnessing an event. All of my solidarity, my pride, my support for the students. Protests on May 17, 2010. Photos by Ricardo Alcaraz of Diálogo. Republished under a CC License. Online citizen media has been a vital source of information during the student strike. Professor and blogger Mario Nuñez Molina (@digizen) has prepared a list of citizen media in Puerto Rico covering the student strike  [ES]. Some of them are: the Río Piedras students blog Desde adentro  [ES] and live radio and streaming of students reporting from Río Piedras through Radio Huelga  [ES]. 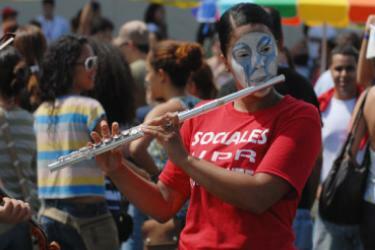 UPR es un país  [ES] is aggregating the digital citizen and alternative media resources. Blogger and graduate student Miguel Ríos created another excellent list of resources that includes Facebook, YouTube, and Flickr . The hashtags #paroUPR , #huelgaUPR , and #radiohuelga  are being used to discuss and follow the student protests on Twitter. Students of the Mayagüez (on the west coast of the Island) campus are using @luchasrum  and the blog Luchas en el RUM  [ES] to inform about their events. 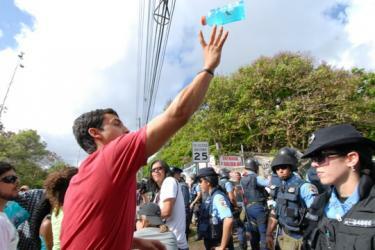 UPR Río Piedras Law professor Erika Fontánez is blogging  about the situation. The members of the Association of Professors also have their blog: Cátedra en acción  [ES]. Anonymous blogger(s) have been writing critical posts about the students, the UPR authorities and the government in Agenda de la nación puertorriqueña  [ES]. The UPR's monthly newspaper Diálogo is also covering the strike . The alternative weekly Claridad is live-streaming the strike  (you have to register first in order to have access). Mainstream media, such as Primera Hora  and El Nuevo Día , are publishing minute by minute accounts of the events.